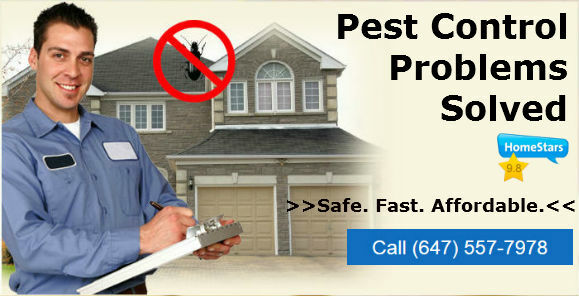 We have over the years built a reputation of providing the best local pest control services in Etobicoke and we have relentlessly worked with homeowners and business premises owners to make their structures free from pest infestation or intrusion by wildlife. We boast of nothing but excellent services given the fact that we have well trained and fully licensed technicians who can carry out any complicated pest control or animal removal. Therefore, feel confident in our services knowing that you are dealing with the right experts and it will be just a matter of time before you get rid of all the irritating and uninvited pests and animals from your home. Pest and wild animals does not discriminate whether to infest a residential or commercial property. T heir agenda is to gain access and go about their business which is essentially spreading diseases and causing damages to any item they come across. But you don’t have to worry about this anymore. With our experience in pest control Etobicoke, ON, we have what it takes to deal with residential as well as commercial pest infestation. We are proud that our pest exterminator uses safe and approved but extremely efficient measures to finish the infestation and remove the intruding animals. Our methods are extremely humane and won’t hurt the animals in any way. 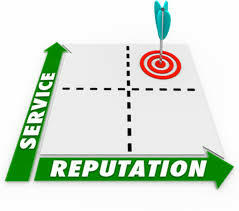 But our services are not only limited to ending pest infestations and wildlife removal alone. Due to the demand from our beloved clients, we also offer services such as dead animal removal and odor neutralization. All these are meant to keep your premises clean and safe after the extermination of the pests. Take advantage of our low prices but extremely high value services. 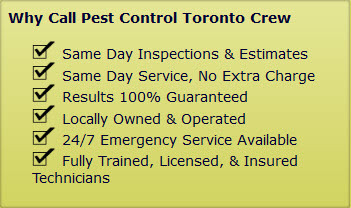 Contact the Pest Control Toronto Crew for a no obligation phone consulatation to determine the nature and extent of the infestation. We proudly service Ajax, Brampton, Burlington, Etobicoke, Maple, Markham, Milton, Mississauga, North York, Oakville, Oshawa, Pickering, Richmond Hill, Scarborough, Whitby, Woodbridge and Thornhill. Call (647) 557-7978 or fill out this form for a call back within 20 minutes!